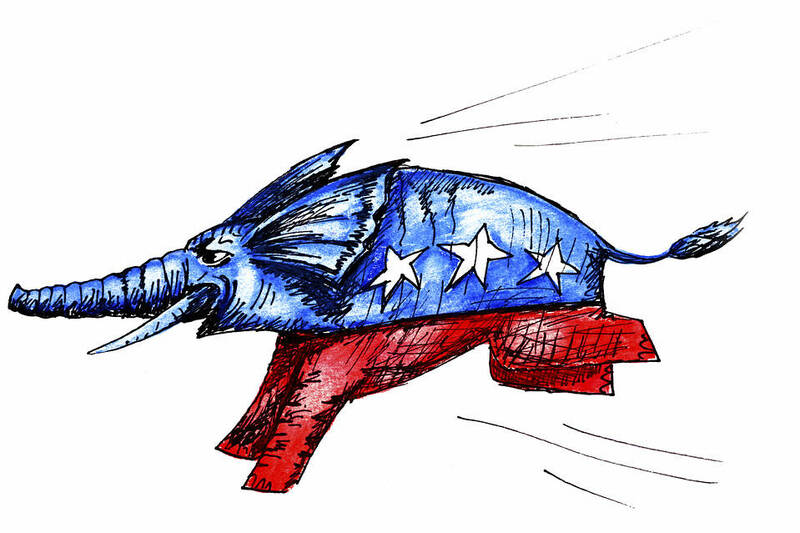 Will the GOP Break Apart or Evolve? A bigger tent, Donald Trump as ringmaster—and an animal unlike the old elephant. Super Tuesday II didn’t so much yield results as reveal continuing trends. Donald Trump up, Hillary Clinton up. This is what I hear from Washington’s Republican political leaders and operatives: Wait and see. There’s still time for Mr. Trump to self-destruct, for voters to start to see through him. In the meantime, get all the delegate-selection rules, all the names and contact points for every delegate picked so far. If we have to fight it on the floor, we fight it on the floor. Or, more delightfully for sentimentalists, in smoke-filled rooms. But he must be stopped. From those Republicans who don’t want Mr. Trump yet recognize and to a degree respect Trump supporters’ critique of the GOP establishment—“You have failed”—there are warnings that cheating him out of the nomination, beating him not through fair cleverness but through chicanery, would break the party and ensure 2016 defeat. They look at those who say they’ll set up their own, new GOP, and think: Any jackass can knock down a barn, but it takes a man to build one. Your venture will go nowhere good. You’ll help produce a second Clinton presidency. Trump supporters do not comprehend the degree to which establishment figures have been concussed, and personally humbled, by his rise. They’ll sneer at this, many of them, but they should see humility as opportunity. From those Republicans who are Never Trump, I hear an unchanged refrain: I can’t back a man who’s essentially an improv act, who has no qualifications for the office, who’s in it from some mad sense of personal destiny. He knows what will play with the crowd but has no idea what he believes, because he believes in nothing and calculates everything. He knows “the price of everything and the value of nothing.” He is at least potentially fascist and probably racist. A side story that may be the central one: It is possible there is some big, unforetold evolution going on within the Republican Party, and more suddenly than anyone would have expected. Mr. Trump is bringing Democrats in. They don’t want to be Democrats anymore, or continue their role as members of always-Democratic families, and they don’t want to vote for Hillary. They’re considering coming fully into the GOP tent. But their presence in the tent, with Mr. Trump as ringmaster means—if the party holds—the GOP transmogrifies into some wholly new jumble of political impulses. Some new issue sets, some new stands that imply a wholly new approach to what conservatism means and is. Readers of this column know much of this will not be unwelcome. It would be good to end illegal, as opposed to legal, immigration—and that, Mr. Trump says, is his plan. It will be good if Republicans absorb the information that no reordering of entitlement spending will be possible until Washington leaders embark on some confidence-building measures that will allow people to trust them to move fairly and realistically. But right now for the party it’s breakage or evolution. The latter would yield an animal that won’t look like the old elephant. It should probably be said again that everything had to fail for Mr. Trump to rise. You know all the failures, but since we seem to be quoting Uber drivers this cycle, I’ll offer the thoughts of one I talked to in Providence, R.I., a month ago. I looked at the other passenger, and our eyes locked. We’d just heard the heart of it, the bottom-line mood. I end with certain Trump questions that nine months in are not answered. I said, “Me too.” You never knew what he’d say next. There was a sense he didn’t know what he’d say next. But does he know the difference between a man who’s attempting to be a political leader and a man who is a mere commentator? Does he understand the former carries deep and particular responsibilities? Just this past week, when asked what would happen if he has most of the delegates needed and the party moves to deny him the nomination at the convention, he blithely responded: “I think you’d have riots.” Coming from a pundit or columnist that would be just another opinion. Coming from a political leader it sounded like a threat. Nice little convention you have here, shame if someone put a match to it. Why does he speak so carelessly and irresponsibly about things such as violence and protests at his rallies? Does he not understand American politics is always potentially a powder keg? He has enough imagination to have invented Donald Trump. Why doesn’t he have enough to understand the potential impact of a leader’s remarks? Does he understand the power he would have if he were a person of normal comportment? Mr. Trump acts surprised and wounded when people suggest he is bigoted. But anyone on social media can see that there is a portion, a quadrant, of his supporters who are rough and wild—anti-Semitic, racist. Maybe, to be charitable, a lot of them are 14-year-old boys acting out on Mom’s computer while she works her second shift. But plenty are actual adults. Someone once said of Franklin D. Roosevelt that he’s like the Staten Island Ferry, pulling all the garbage in his wake. FDR’s Democratic coalition did contain some garbage, from KKK-supporting Southern Democrats to New York communists. That was some wake! It was also 80 years ago. America is an imperfect country populated by imperfect people, but there would be a reason Mr. Trump draws the particular kind of garbage he draws. What is it? And the central unanswered question: Is Donald Trump just a nut carried along by forces he himself doesn’t understand? Or is he something more than that, and more confounding?